In May of 2015, Kim and Carol Pedersen made their first visit to Korea. 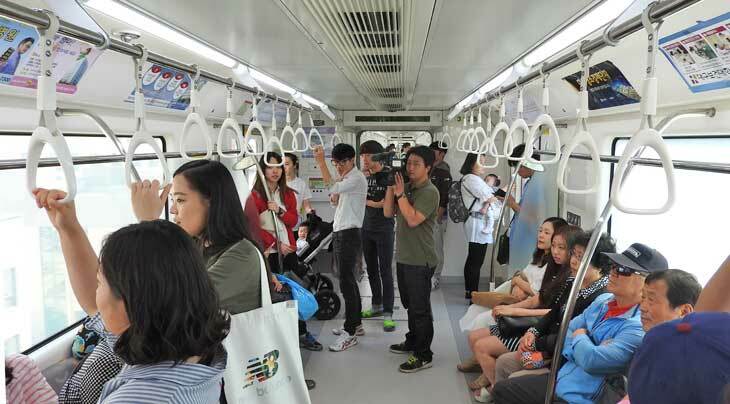 The primary reason for the trip was to document and experience the newly-opened Daegu Line 3 Monorail. 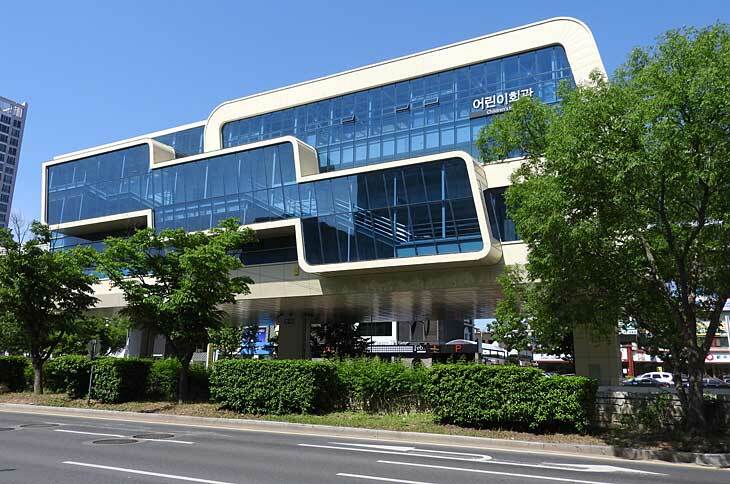 The trip was primarily taken to ensure the latest and best possible images for Kim's comprehensive book, Monorails: Trains of the Future-Now Arriving. Mission accomplished! This special features a number of non-book photos from the trip. Welcome to the 17th floor of the Eldis Regent Hotel. We had asked for a room with a monorail view, and the hotel staff came through with this amazing corner room. 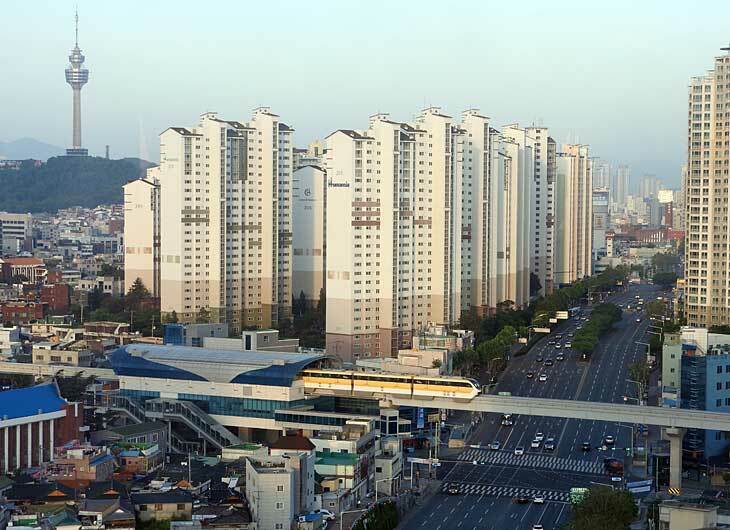 Floor to ceiling windows provided this extraordinary view Daegu, South Korea. From the room we could easily see and walk to Sinnam Monorail Station, roughly the center of the 24-kilometer system. 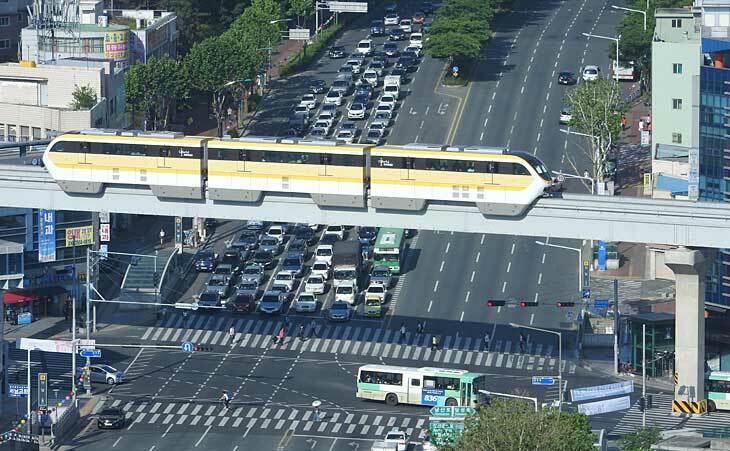 Often repeated here: monorails don't mix with traffic and therefore are faster and safer. Any questions? Mr. Ahn provided Kim and Carol Pedersen with some wonderful keepsakes of the new system, now proudly in the possession of The Monorail Society Archives. 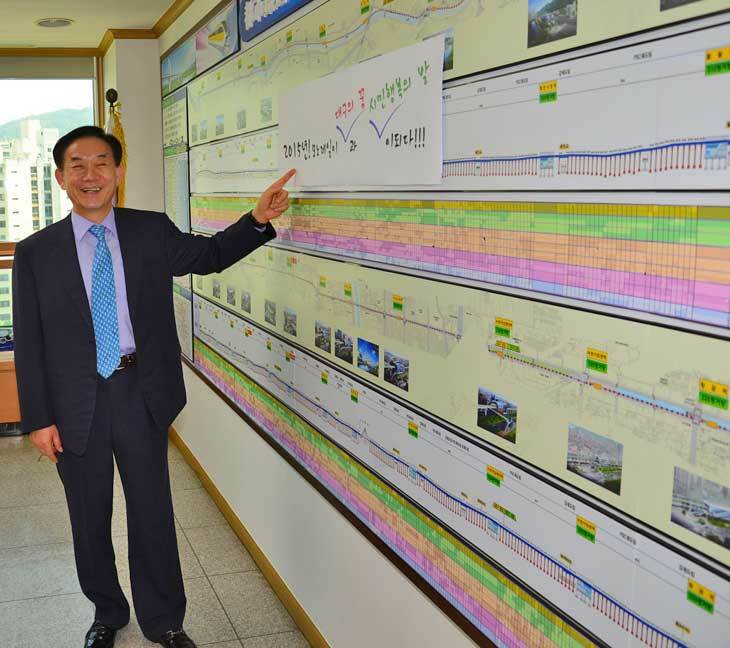 Our sincere thanks to Mr. Ahn for taking time out of his busy schedule to meet with us. 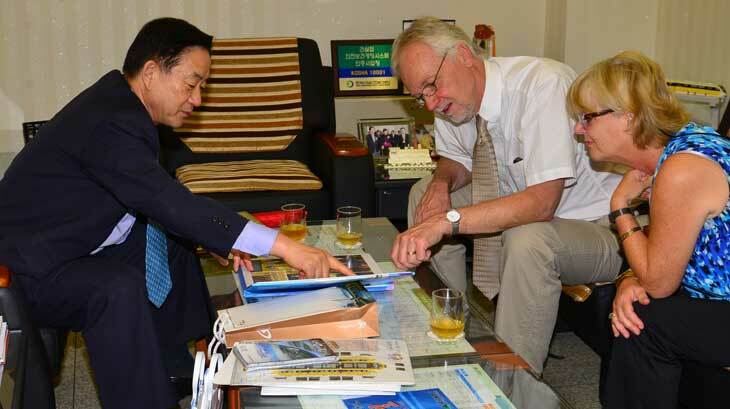 A fun surprise was that our visit was featured in the local newspaper the following day (photo courtesy of Daegu Metropolitan City). 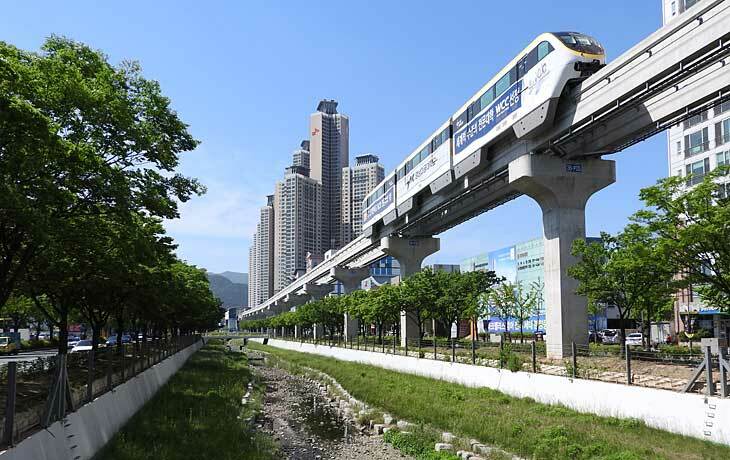 The Daegu Monorail is extremely picturesque, by design. 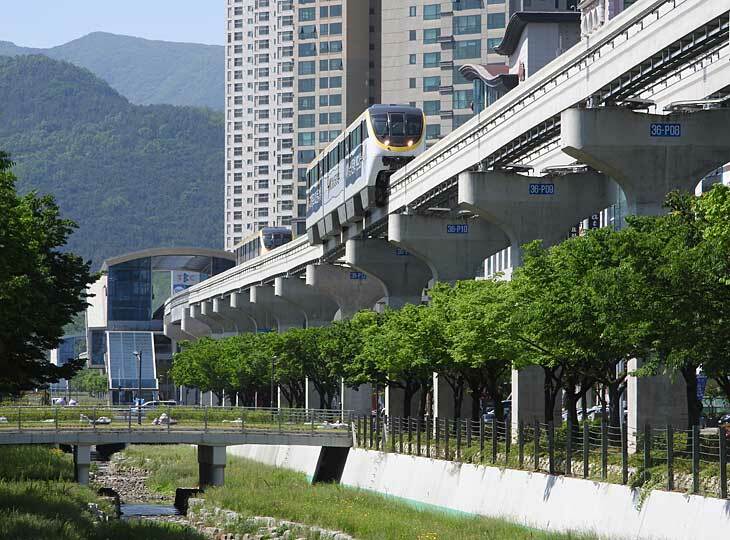 In the southeastern portion of the line the monorail follows a canal and is lavishly landscaped, including these trees below the guideway. 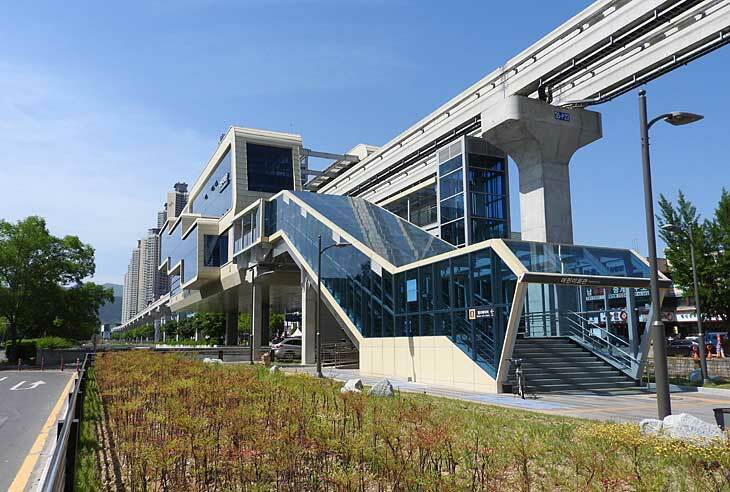 Daegu Monorail has 30 stations, and numerous stations feature their own unique architecture. Childrens' Hall Station looks great in the day, but you should see it lit up at night! The brand new monorail is already a huge success. Media continues to give the system positive attention, note the video crew at work.